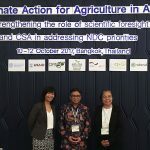 BANGKOK, Thailand – As part of their Nationally Determined Contributions (NDCs), members of the Association of Southeast Asian Nations (ASEAN) have identified measures to strengthen climate resilience and reduce greenhouse gas emissions from agriculture and land-use sectors. And to achieve these NDC targets, the scaling-up of climate smart agriculture (CSA) practices plays a valuable role. 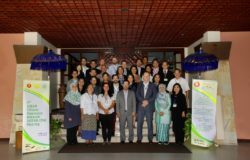 This is one of the topics discussed in the Climate Action for Agriculture (CAFA) Workshop held from 10-12 October 2017 at the ibis Styles Bangkok Khaosan Viengtai in Bangkok, Thailand, which brought together participants from ASEAN, Bangladesh, non-government organizations (NGOs), civil society organizations, and investment think tanks. 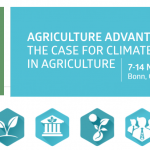 The overarching purpose of the event is to strengthen the capacities of countries in Asia to achieve their NDC targets for the agriculture and land-use sectors, through improved use of scientific information in sector planning and enhanced public and private sector engagement in accelerating CSA investments. 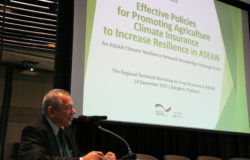 Co-organized with the Food and Agriculture Organization (FAO) of the United Nations and other partners, the ASEAN Climate Resilience Network (ASEAN-CRN), participated in Sessions 1 and 2 of the workshop, in the topics Progress Since Paris – Perspectives for Agriculture, and Role of CSA in Achieving the NDCs, respectively. In Session 1, Dr. Margaret Yoovatana of the Thailand Department of Agriculture and Chair of ASEAN-CRN shared the experiences and updates of the network in engaging with the United Nations Framework Convention on Climate Change (UNFCCC) processes through the ASEAN Common Positions on Agriculture. Drawing upon the common priorities for agriculture identified by the ASEAN member states (AMS) in their respective Intended Nationally Determined Contributions (INDCs), the Common Position has been developed in 2016 and was fed into the Position of the G77 and China group at the 22nd session of the Conference of Parties (COP22) in Marrakesh, Morocco. However, despite efforts to put forward this agenda, attempts at submission of a text for a decision on issues related to agriculture at COP22 and the 46th Subsidiary Body for Scientific and Technological Advice (SBSTA) have been unsuccessful. As the current Chair of the ASEAN Ministers of Agriculture and Forestry (AMAF), Thailand will again raise the Common Position and lead the ASEAN Negotiators Group under the G77 & China group in the upcoming COP23. In Session 2, Ms. Imeda Bacudo, Senior Advisor of the Forestry and Climate Change (FOR-CC) project, shared the work and achievements of ASEAN-CRN as a successful multi-stakeholder knowledge platform for promoting climate resiliency through exchange of information, expertise, and experiences on CSA among AMS. 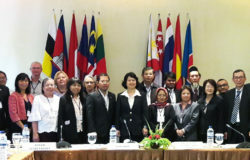 Since its establishment in 2015, and in collaboration with its various and diverse set of partners, ASEAN-CRN has facilitated a wide array of work areas ranging from the conduct of national studies to identify CSA practices in each member states (and compiled in the regional study titled Promotion of Climate Resilience for Food Security in ASEAN); conduct of regional knowledge exchange events and South-South cooperation between member states for scaling-up of specific CSA practices; engagement in international negotiations and policies; and support in the national-level implementation of regional agreements, among others. The results of these activities were developed into various policy guidelines which ASEAN can follow in the scaling-up of prioritized CSA practices. The network continuously furthers the promotion of CSA practices by sharing its work to reach other networks in Asia. Another success story of scaling-up CSA is captured in the work of the Rice Watch and Action Network (RWAN), an NGO partner of the ASEAN-CRN, whose projects humbly started from grassroots level and now being implemented at the national scale in partnership with the Philippine Department of Agriculture. RWAN works with local government units in supporting communities in the Philippines to attain a climate-informed, sustainable and resilient agriculture. When asked about the challenges in the program implementation, Ms. Hazel Tanchuling (RWAN Executive Director) shared that there is a need to turn their initiatives into a national policy and program that will still allow for area-specific interventions and innovations. Moreover, she mentioned that support counterparting is difficult due to restrictions in the national government when it comes to procurement, logistics, mobilization of people, and the implementation structure of the national agency. Despite this, the benefits still outweigh the challenges – the program has become a source of pride among the stakeholders as the pilots have become showcase for adoption of other communities. “Scaling-up CSA practices is a collaboration of many stakeholders and mobilization of many actions. To do this effectively, respect and recognition of all the intellectual contributions and individual experiences should be primordial”, Ms. Tanchuling concluded. The CAFA workshop is organized by FAO in cooperation with the ASEAN-CRN, the ASEAN German-Programme on Response to Climate Change in Agriculture and Forestry (GAP-CC) implemented by GIZ, the USAID-funded Climate Economic Analysis for Development, Investment and Resilience (CEADIR) Activity, International Center for Tropical Agriculture (CIAT), Global Alliance for Climate-Smart Agriculture (GACSA), and the World Business Council for Sustainable Development (WBCSD).